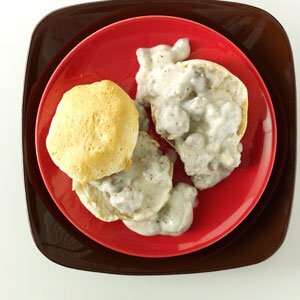 Nothing satisfies more than plate of biscuits and gravy. For a long time I used a dry mix not realizing that this is just as simple and tastes great! In a large skillet over medium heat, cook sausage and onion until the sausage is no longer pink. Drain, reserving 2 tablespoons drippings in skillet.